TAFE NSW-South Western Sydney Institute’s annual achievement awards night were held in Campbelltown last week and local Samantha Mancuso walked away with a great sense of pride and achievement. 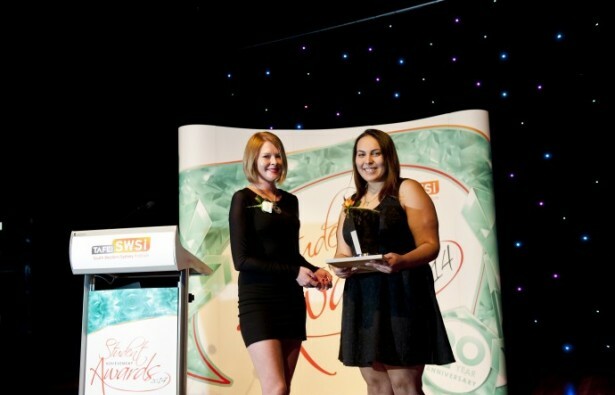 Samantha accepting her Aboriginal and Torres Strait Islander Student of the Year award. Samantha picked up the award for Aboriginal and Torres Strait Islander Student of the Year, for her outstanding success in the Certificate III in Business Administration course. “It was a really great night! I was told that I had won the award a little while ago. It was a surprise because I’ve never really won anything before, so being nominated by my supervisor and teachers that I was both working with and in the classroom with, made me really happy.” Samantha says. After finishing high school in 2012, Samantha wasn’t sure what she wanted to study or pursue as a career. She happened to come across an advertisement for a traineeship at the Business Development Unit at Liverpool TAFE, and decided to take the plunge and got the job. Samantha undertook the Business Administration course in between working at the Business Unit. “My work and my course went together really well, I would go to class and learn, and then come back to work and be able to apply what I had just learnt. I was even showing some of my work colleagues new ideas and ways of doing things,” Samantha says. Peter Roberts, Director at TAFE SWSi, says the 20th Student Achievement Awards is a celebration of South Western Sydney’s best and brightest in vocational education and training. “Samantha Mancuso was chosen from a great depth of talent at TAFE SWSi,” Mr Roberts says. Samantha’s teacher, Julie Sweeney, was equally impressed and proud of her star pupil’s efforts. “Samantha displayed a maturity well above her years. She is well rounded and has very clear plans for her future. I have every confidence that this award is just the first of many for Samantha,” Ms Sweeney says. Samantha says that she couldn’t have done it without support. After finishing her traineeship with Liverpool TAFE, Samantha decided to undertake a university degree. “I am now studying a Bachelor of Education (Primary School Education) at University of Western Sydney in Bankstown. I’ve finished up with the business development unit and am now working at both Busby and Heckenburg Primary Schools, which I’m really enjoying.” Samantha says. The post Star student picks up TAFE Award appeared first on Deadly Vibe.